Pauline Lyon, who had two children in her 50's with IVF, supports giving the treatment to older women. 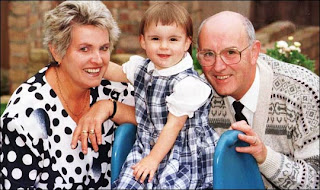 Pauline made history in 1995 when she gave birth to Lauren at the age of 51 — becoming, at the time, Britain's oldest mum. Four years later, she had IVF again, to conceive Brodie. She and husband David, 62, both have grown-up children from earlier marriages but wanted a family together. And the American study confirmed what they believed all along — that older mothers have more patience and just as much energy as many young mums. She says: I often talk to much younger mums at the school who say, ‘Oh God, Im knackered today. But I never feel like that.